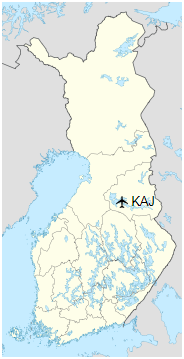 Kajaani Airport (IATA: KAJ, ICAO: EFKI) is an airport in Paltaniemi, Kajaani, Finland, approximately 7 kilometres (4 mi) northwest of Kajaani city centre. Construction of the airport began in 1939 with the runway being completed in the autumn. However, because of the outbreak of World War II it would not be until the 22 June 1956 that the airport would be officially opened. The airport was Finavia airport of the year in 1994, 1997 and 2007.